The Lord obtained the name Vijayasanar at the request of Vedawit, a brahmin, who performed tapas invoking of Lord Vishnu. This is one among the Azhwar Nava Tiruapthi. 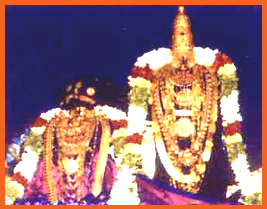 Sri Manavala Mamunigal has sung about this kshetram. Thaayaar - Varagunavalli Thaayaar, Varagunamangai Thaayaar. Theertham - Agni Theertham, Deva Pushkarini. Sree Vijayasanar Perumal, Moolavar in Veetrirunda kolam, facing east direction. Prathyaksham for Agni Bhagavan, Romasa Maharishi and Sathyavan. Varagunamangai Divya desam is located about 2.5 kms east of Srivaikuntam Railway Station on the Tirunelveli - Tiruchendur line.There are no houses here and one has to make prior arrangements to visit the temple. It is well known as Nattham among the locals.